We're raising awareness of the serious health and welfare issues associated with certain dog breeds. Vets across Australia care for dogs with all types of needs. Unfortunately, some dogs have serious health and welfare problems simply because they’ve been bred to look a certain way. 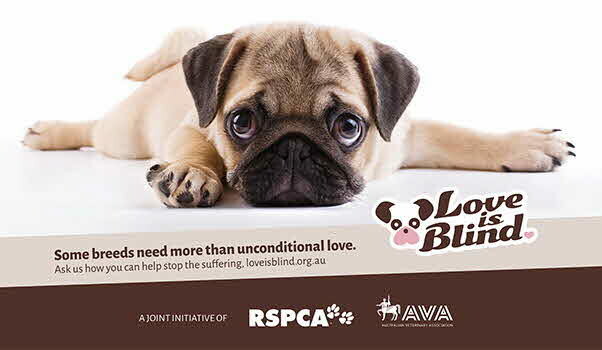 Love is Blind is a joint initiative of the Australian Veterinary Association and the RSPCA. We’re raising public awareness about the animal welfare problems caused by exaggerated physical features such as brachycephaly, short limbs and excessive skin wrinkling, and how these problems can be prevented. This campaign calls for everyone including vets, breeders, and owners to work together to address these issues. It encourages dog breeders to avoid selecting for exaggerated features that compromise dog welfare, and prospective puppy buyers to help by choosing not to buy puppies with exaggerations that cause welfare problems. Owners and breeders alike love these dog breeds, but we need to ensure that good health and a good quality of life are prioritised above physical appearance. Some breeders are aware of these problems and are working to address them. The Australian National Kennel Council has developed screening initiatives for a range of these issues. Potential owners should source dogs from the responsible, registered breeders who participate in such screening programs and avoid buying online from unregistered breeders, or worse, puppy farms. You can find links to information for dog owners, breeders and prospective dog owners below. AVA President, Paula Parker also speaks candidly in some of these videos about her own experiences with treating the many health issues associated with flat-faced dogs. People looking for a new puppy or dog may not be aware that dogs with exaggerated features are at risk of poor health and welfare throughout their lives. Dogs with exaggerated features that compromise their welfare have special needs and require specific veterinary care to try to help them be more comfortable. Vets play an important role in helping to educate breeders on prioritising good health and a good quality of life above physical appearance. The sad story of Diego is unfortunately not a rare one, with many dogs suffering as a result of their exaggerated features. You may have heard the term ‘flat-faced’ and ‘squishy-faced’ used to describe dog breeds such as pugs, French bulldogs and British bulldogs. If you have a squishy-faced or flat-faced dog you need to know the signs if their life is in danger. ‘Flat-faced’ and ‘squishy-faced’ dogs, have welfare and health issues specific to their breed - get to know how to help your dog be the healthiest it can be.